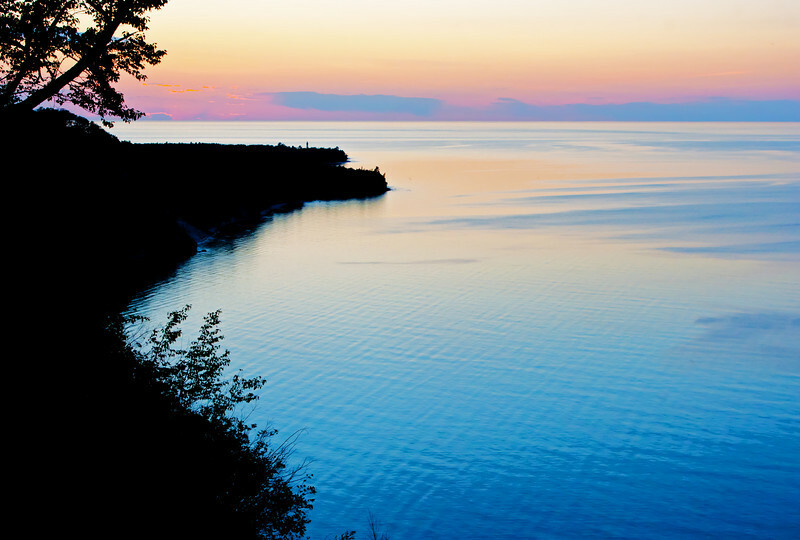 Scenic views of the beauty of Northern Michigan. 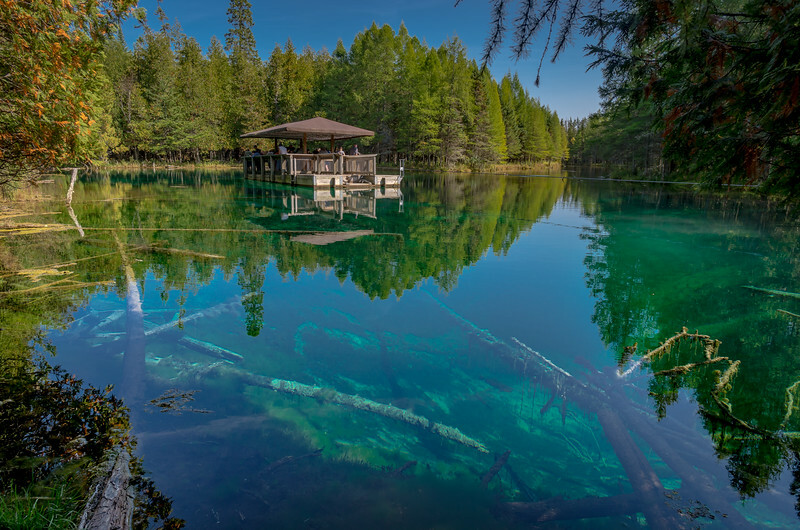 The Big Spring also known as Kitch-iti-kipi is Michigan’s largest spring. 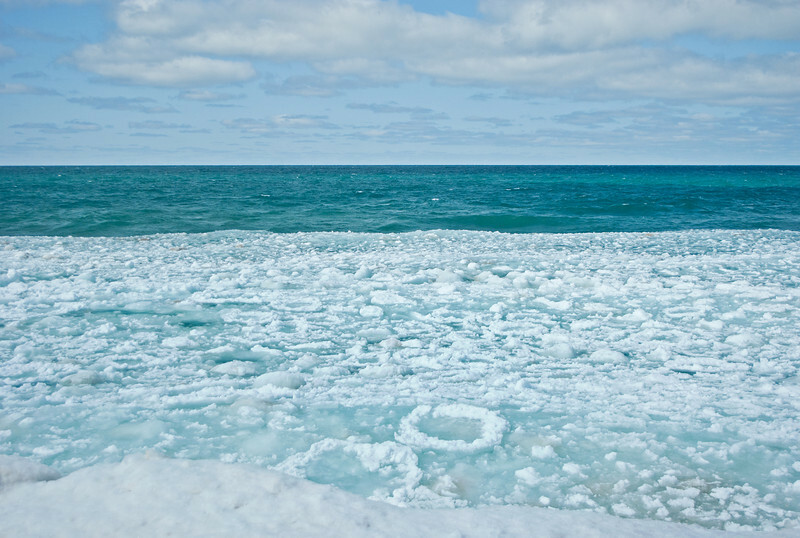 It is 200’ in diameter, 42′ deep and delivers 16,000 gallons of crystal clear water per minute. 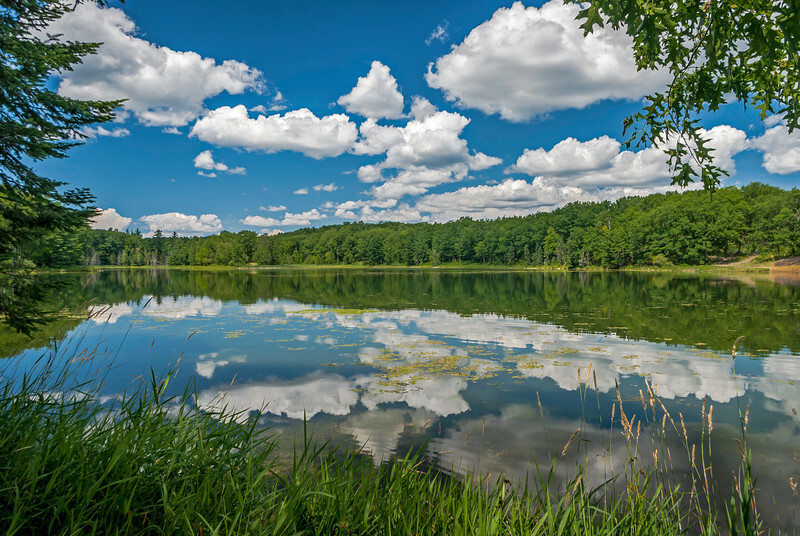 You can ride the raft for a beautiful view across the spring. 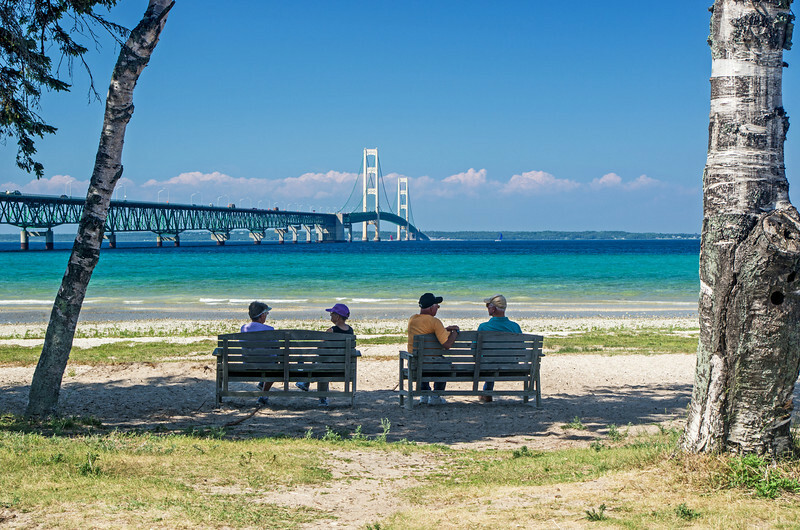 Old friends enjoy a summer's afternoon in Mackinaw City in front of The Mackinac Bridge which connects the Upper and Lower Peninsulas of Michigan. 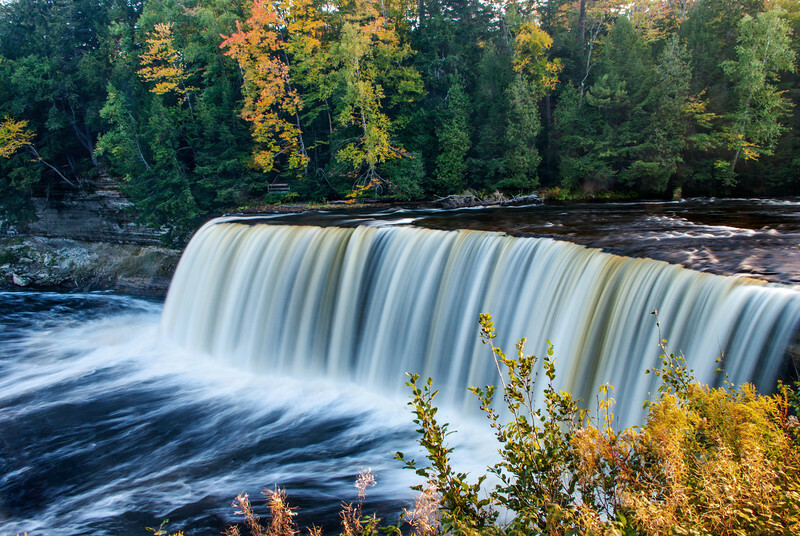 Autumn colors at Tahquamenon Falls State Park, Michigan. 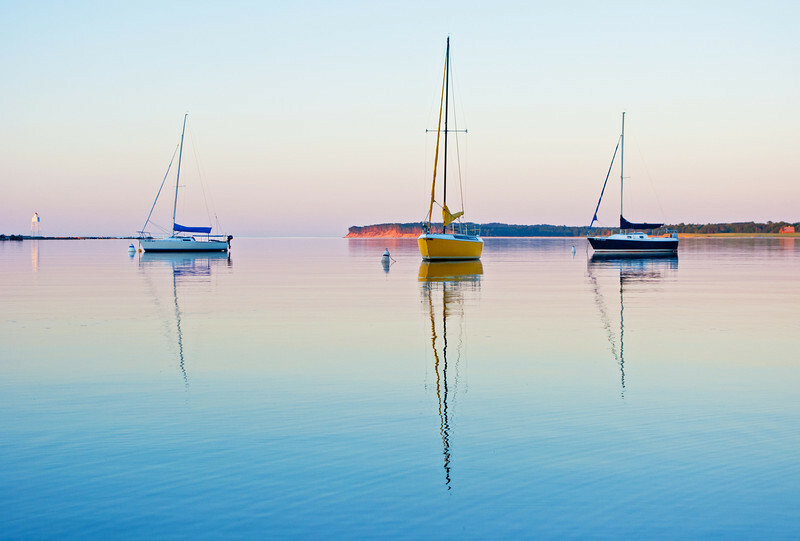 Calm summer evening on the bay in Grand Marais Michigan. 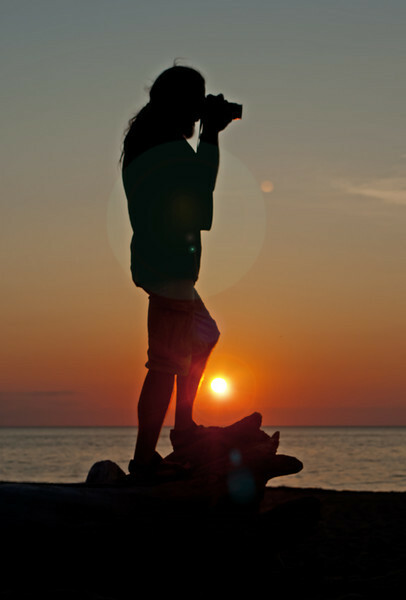 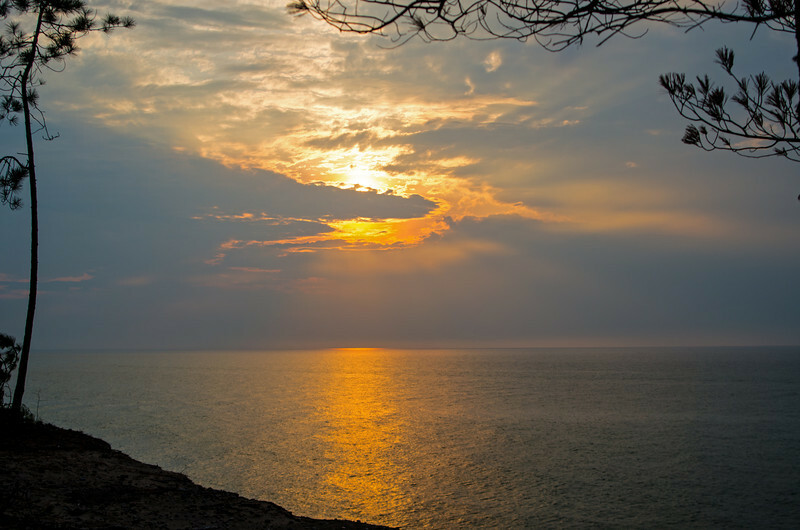 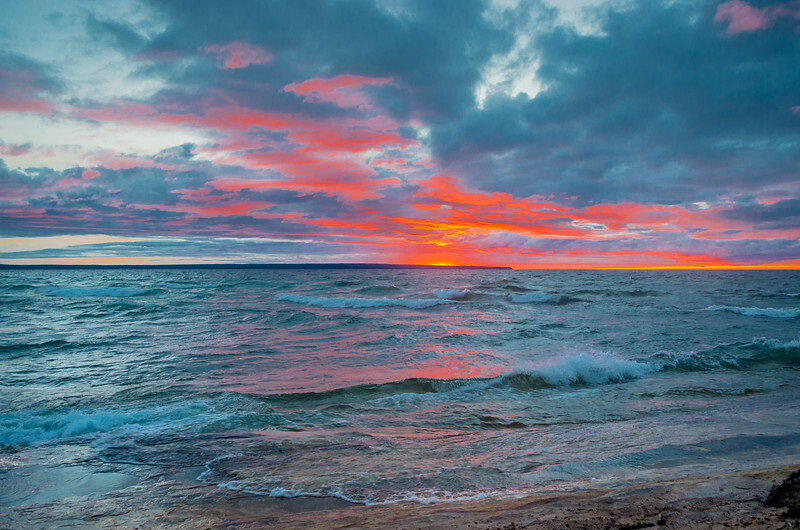 The sun sets over Au Sable Point in the Pictured Rocks National Lakeshore. 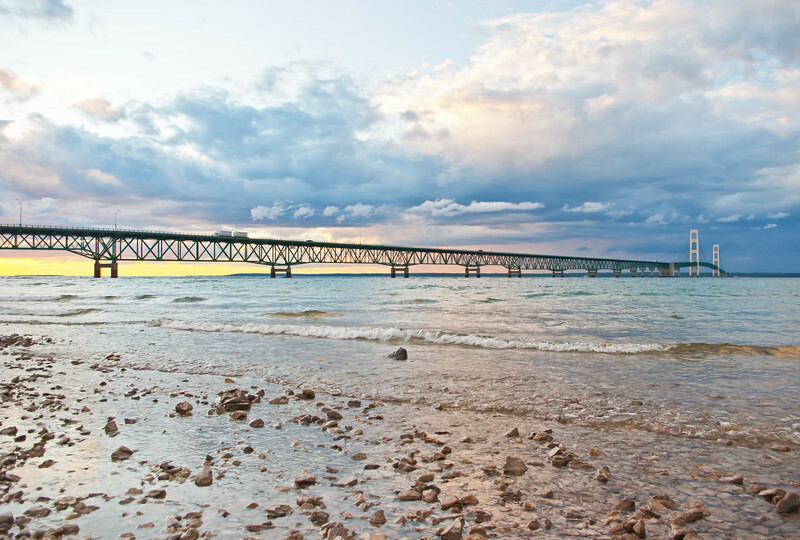 A footbridge crosses Section 34 Creek along the trail to Chapel Beach in the Pictured Rocks National Lakeshore. 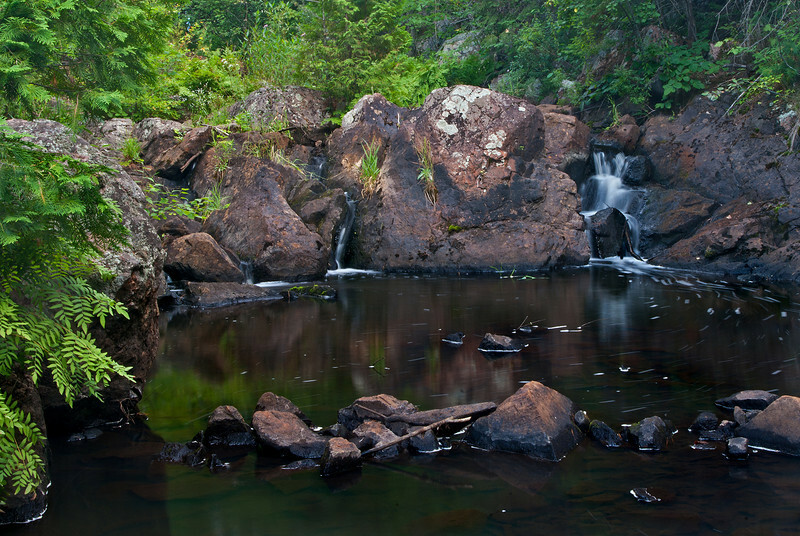 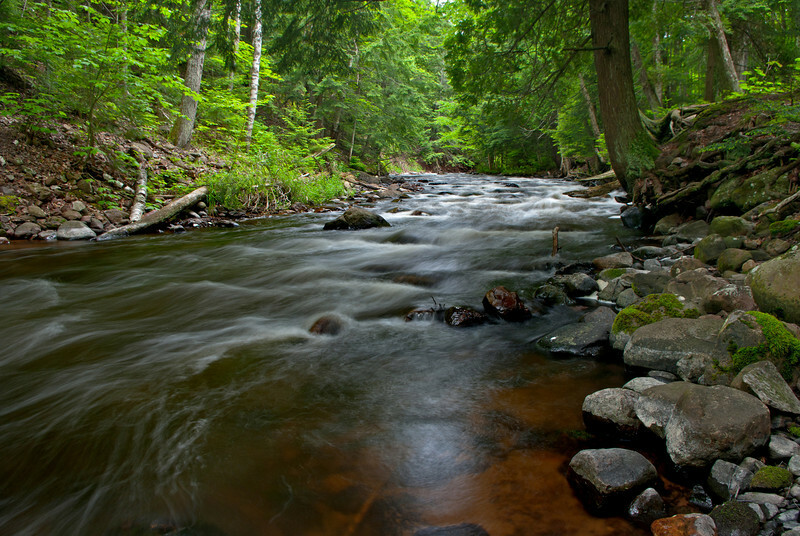 The Carp River flows toward Marquette Mountain. 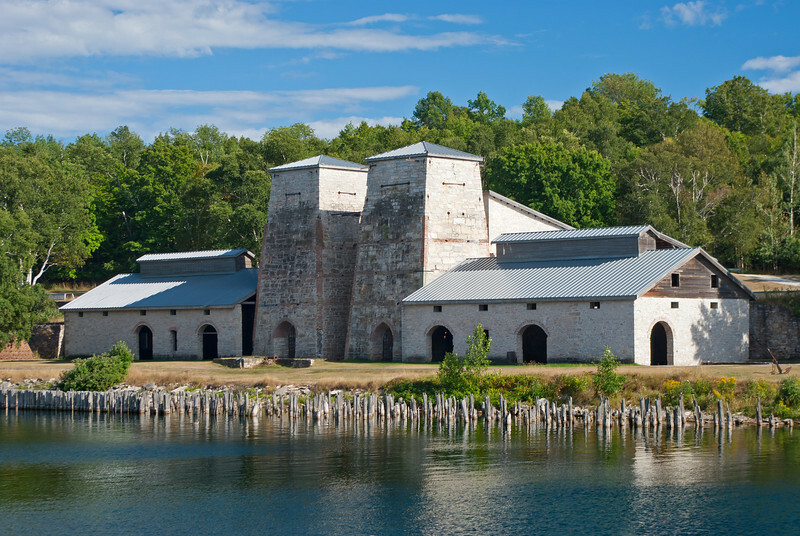 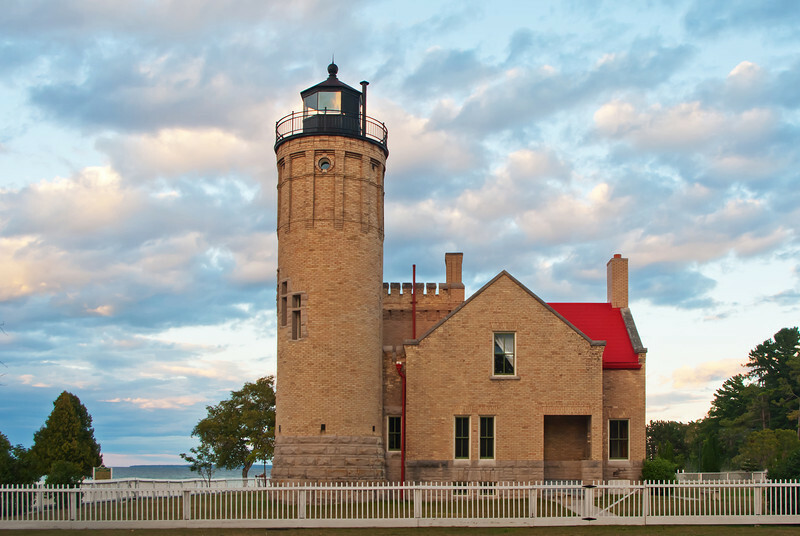 Surrounded by the blue waters of Lake Michigan and Big Bay de Noc, the historic town-site of Fayette Michigan is a beautiful destination. 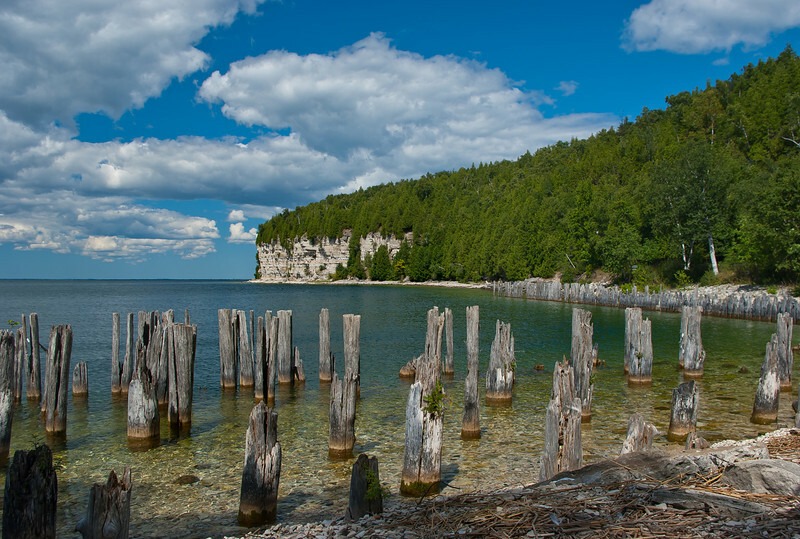 The Limestone Bluffs at Fayette are breath-taking in their beauty. 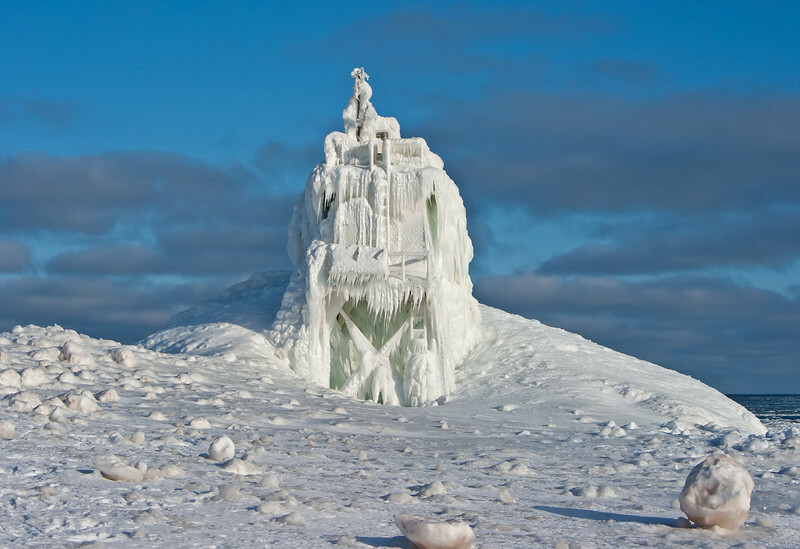 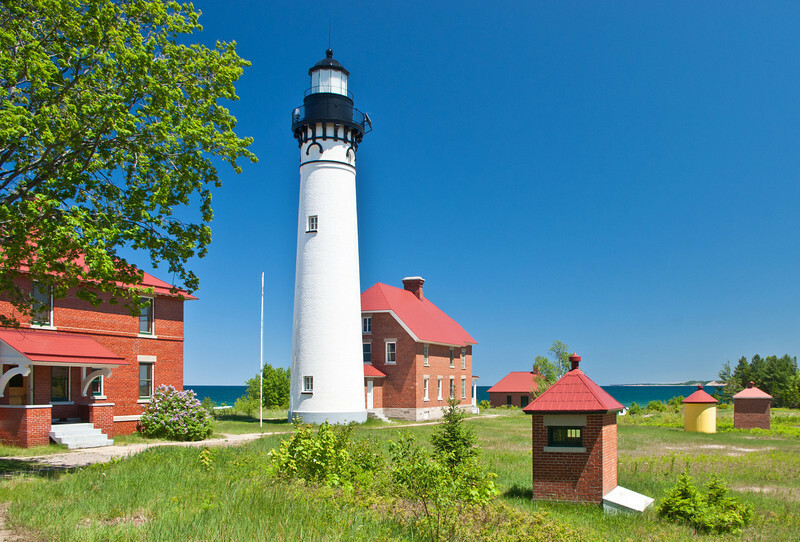 High above Lake Superior, Au Sable Lighthouse overlooks Grand Sable Banks in the Pictured Rocks National Lakeshore. 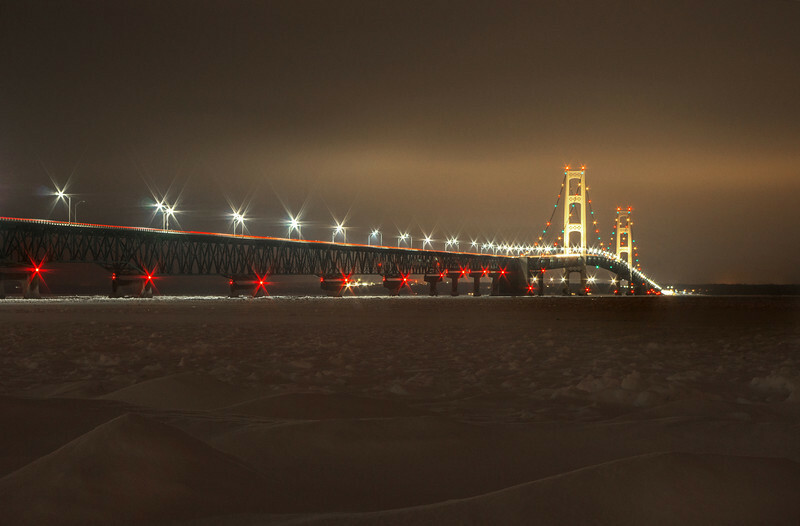 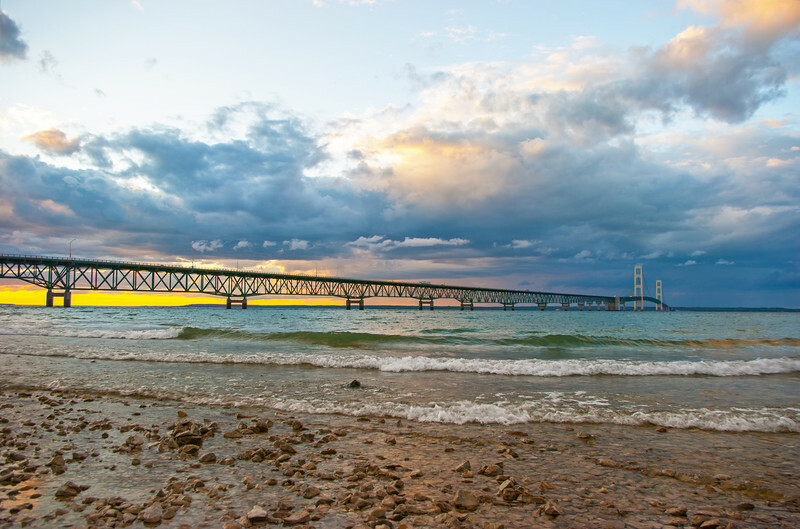 An approaching storm highlights the Mackinac Bridge, third longest suspension bridge in the world. 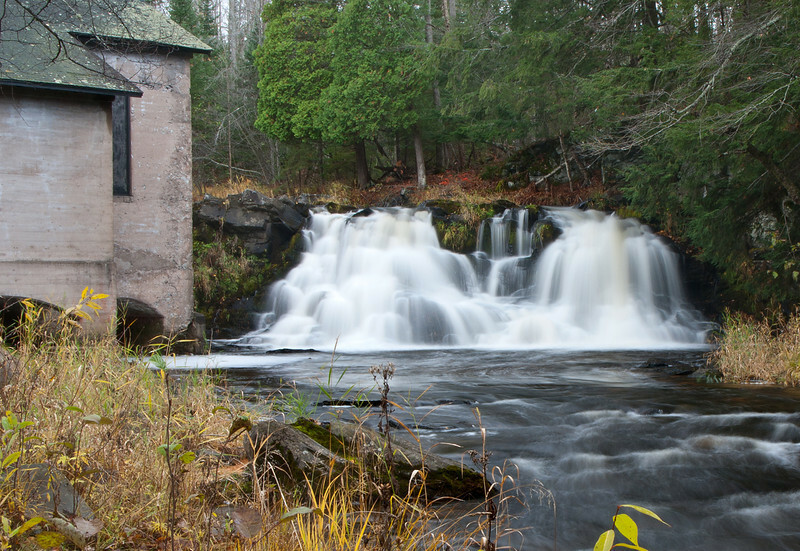 This long abandoned powerhouse located near the town of L’Anse Michigan gives these waterfalls its name. 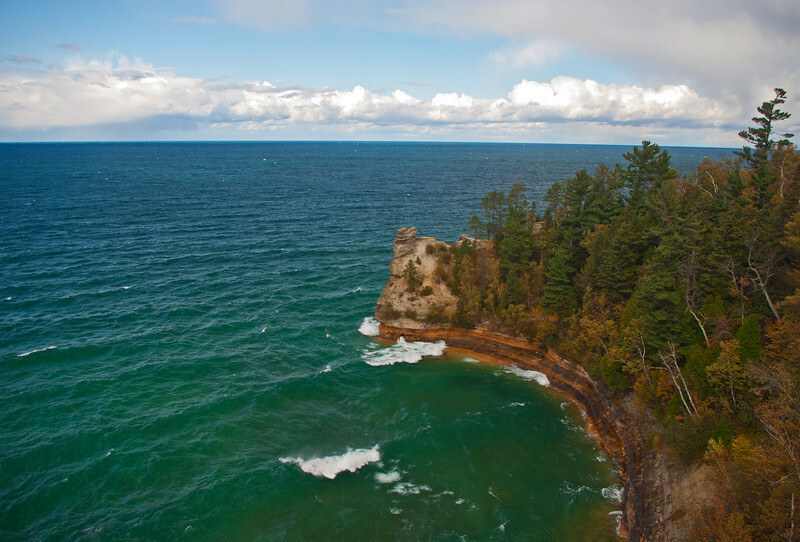 A brisk autumn day along the shores of Lake Superior in the Pictured Rocks National Lakeshore. 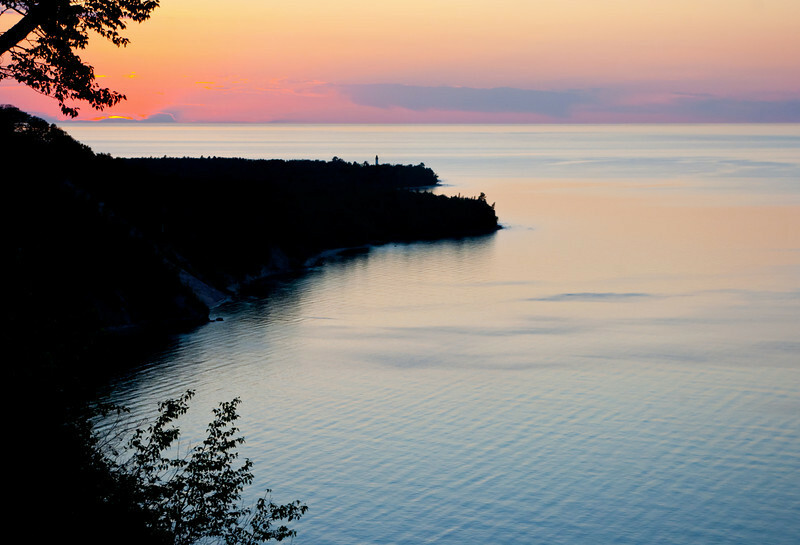 The setting sun brings the close of another beautiful day in the Pictured Rocks National Lakeshore. 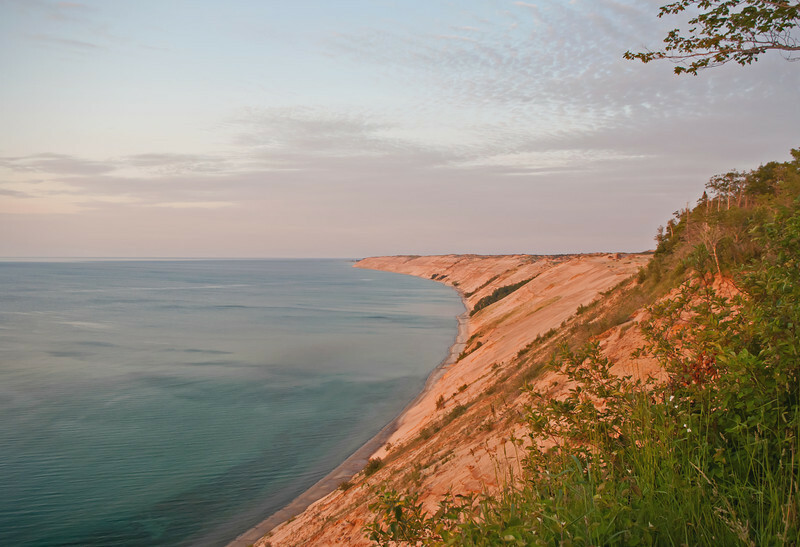 Evening light lends a warm glow to Grand Sable Banks in the Pictured Rocks National Lakeshore. 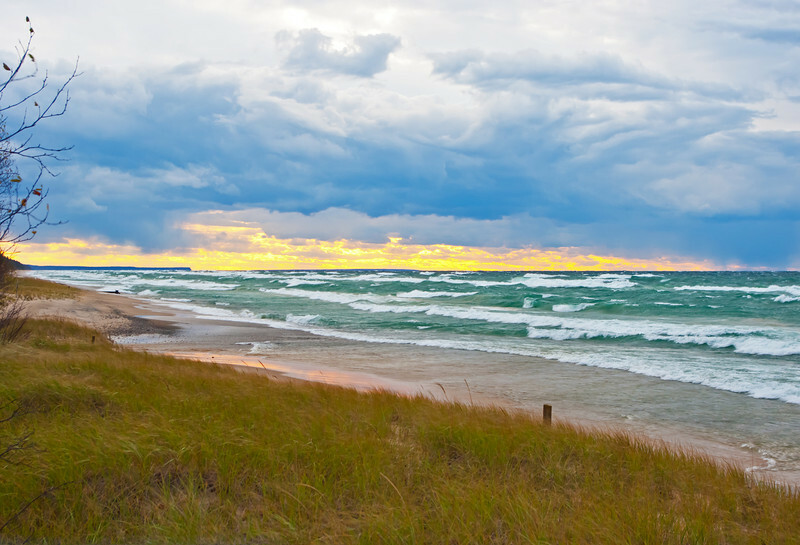 A storm approaches an area known as Sullivan’s Landing, part of 12 Mile Beach in the Pictured Rocks National Lakeshore. 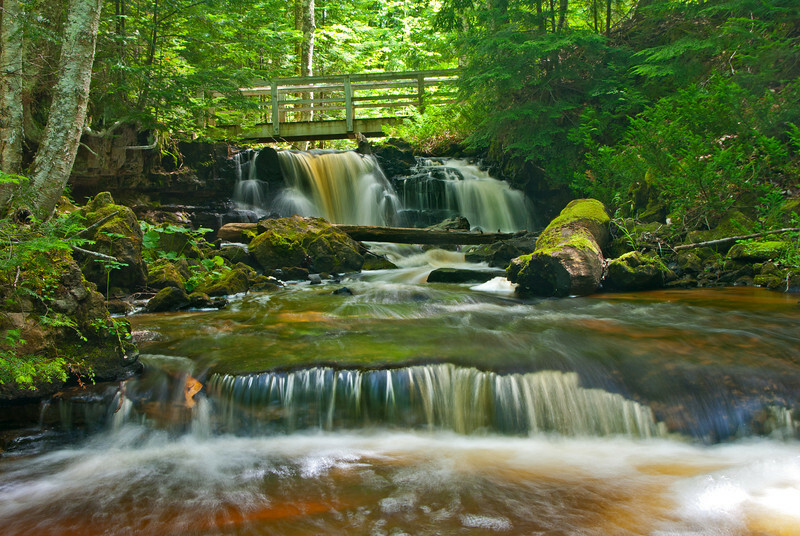 This beautiful little falls flows through a deep pink-tinged rocky ravine and is located in a remote area not far from the town of National Mine Michigan. 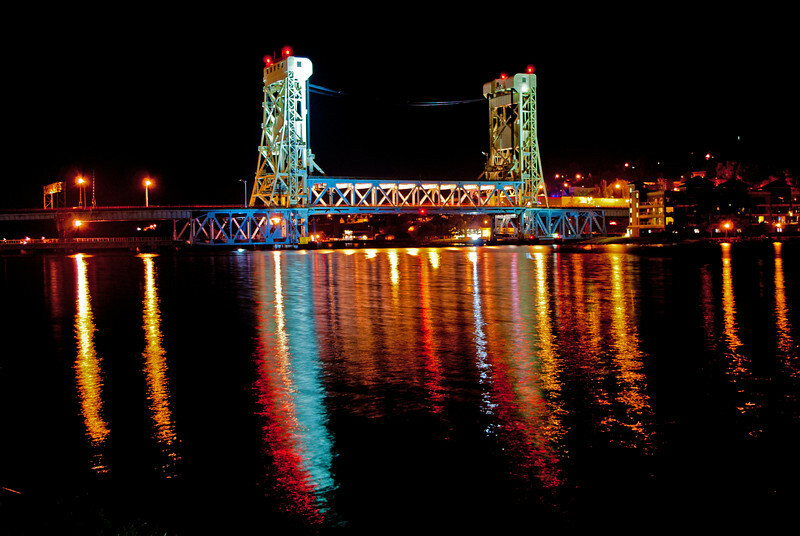 The Houghton–Hancock Bridge also known as the Portage Lake Lift Bridge connects the cities of Hancock and Houghton Michigan. 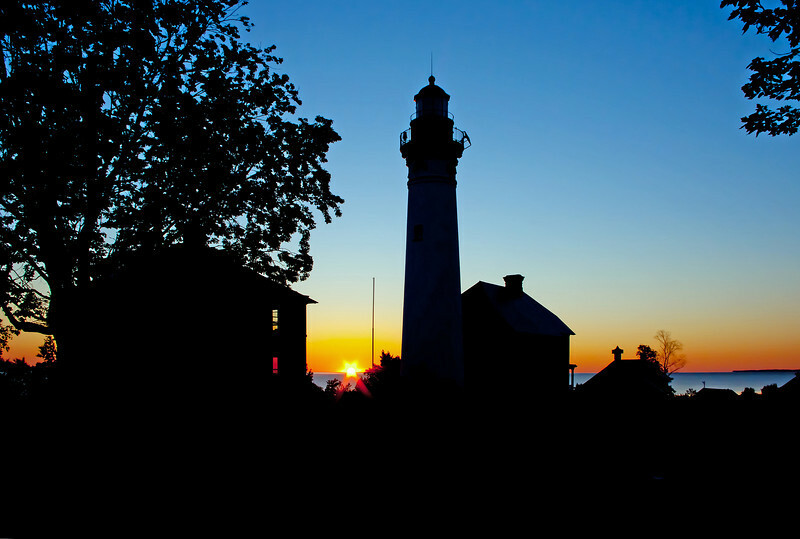 Sunrise at Au Sable Point Lighthouse in the Pictured Rocks National Lakeshore. 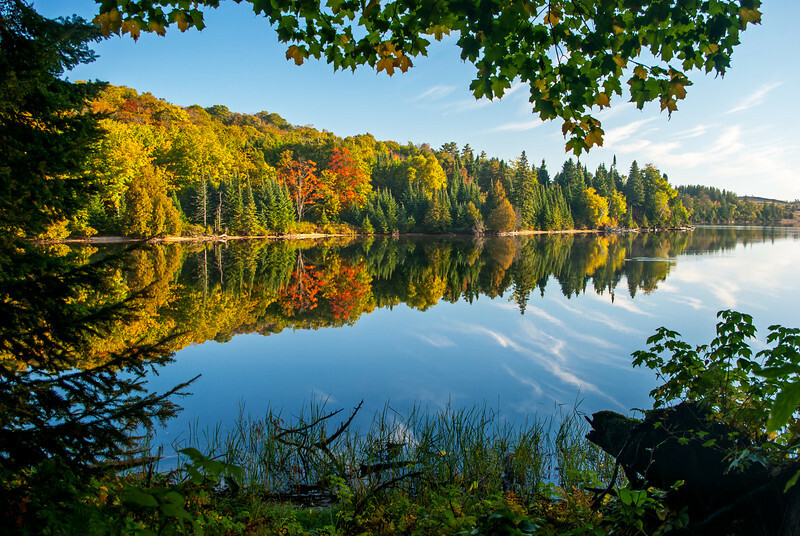 A fall morning reflections on Grand Sable Lake in the Pictured Rocks National Lakeshore. 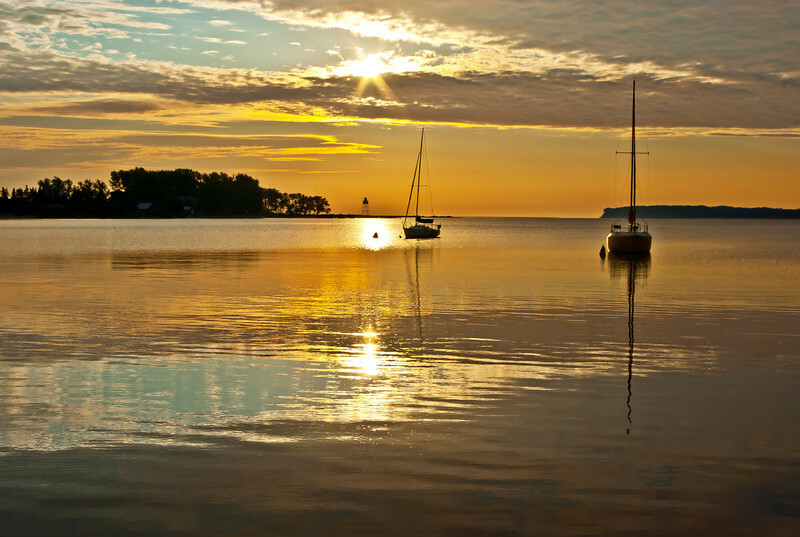 The beginning of another beautiful day in Grand Marais Michigan. 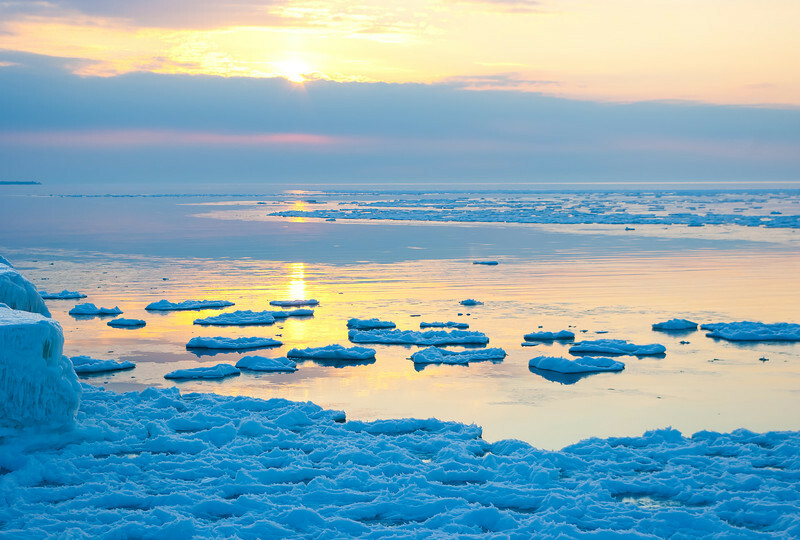 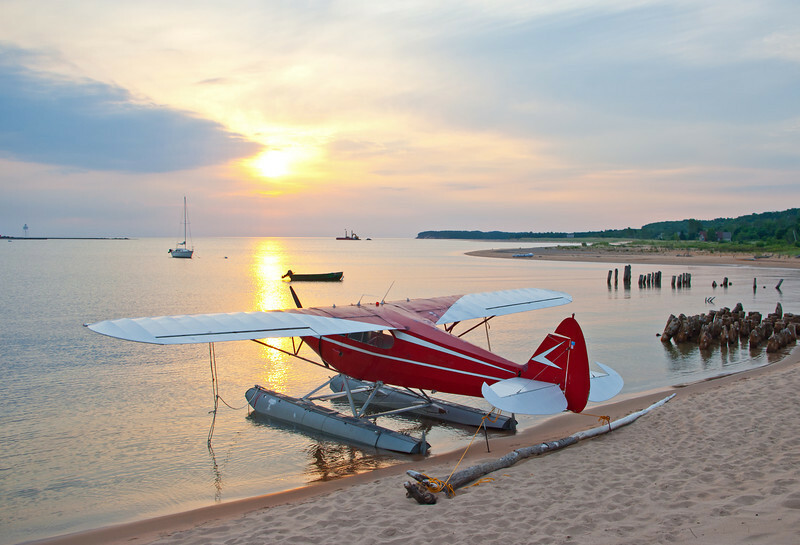 The sun rises on the Annual Splash-in,Grand Marais Michigan. 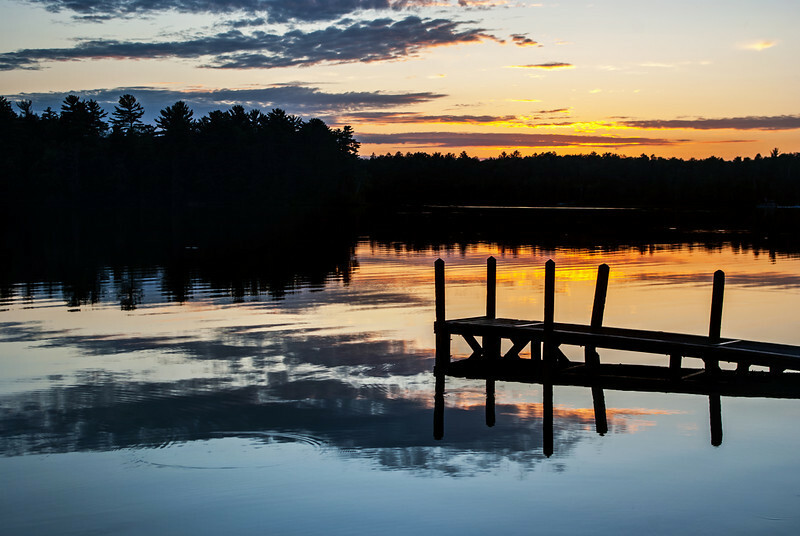 Warm evening sunset at Little Lake in the Escanaba River State Forest,Michigan. 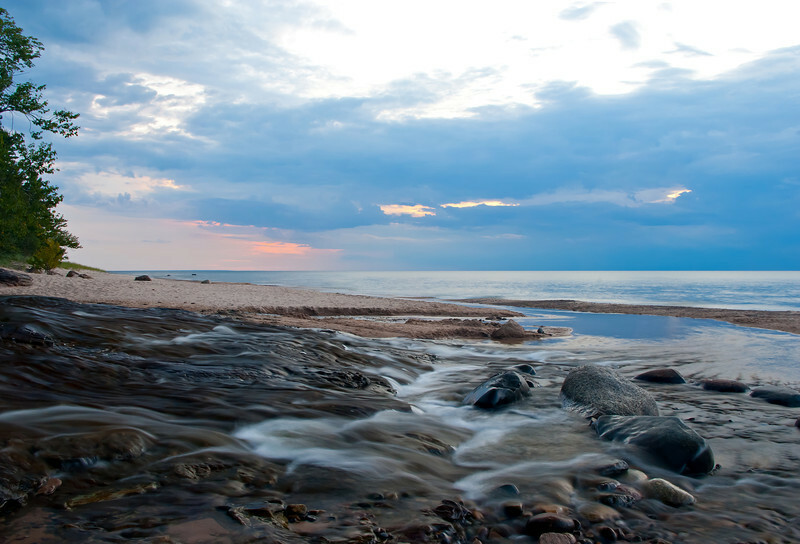 An evening storm approaches the mouth of the Hurricane River in the Pictured Rocks National Lakeshore.